I was browsing the newspaper at the gym yesterday when I read a small news entry at the bottom of the front page. After 60 years of direct flights from Amsterdam to Manila and vice versa. KLM has terminated this route as the last KLM flight to Amsterdam left Manila on March 25, 2012. The reason behind this change is because of the Common Carrier Tax, which charges European airlines 3% on top of the 2.5 gross on billing tax. Now, I’m no genius in math and taxation but it seems that KLM discontinued its direct flights to save money. Now,we can’t blame them for that. It is also because of the Common Carrier Tax that many European Airlines stopped direct services ages ago. Now, this answers my questions that have long been bugging my mind ever since I was scouting for flights for my trip to Europe 2 years ago. It’s just to expensive to operate. After all, we are living during difficult economic times. As the saying goes, “Shape up or Ship out!”… or “fly out” that is. The new Manila – Taipei – Amsterdam flights now leaves Manila in the evenings (KLM used to fly in the mornings) with a 2 hour (+/-) lay over in Taipei and arrives in Amsterdam at 6:10 in the morning of the next day. Celebrating the New Year in Puka Beach. Kids play on the shore.. While Russians bathe under the hot January sun. As I have stated in my previous blog (click here ), Puka Beach is always our favorite spot on the entire island of Boracay. Located at its northern tip, it is a perfect getaway from the crowded and bustling White Beach. I just want to share this short video I took to show how beautiful this stretch of beach is. Since we were here around January, it falls under the Amihan season, where in the cool southeast wind brings in the dry season (from November to April) . This means that the northern and eastern parts of the island gets lots of wind and high waves. 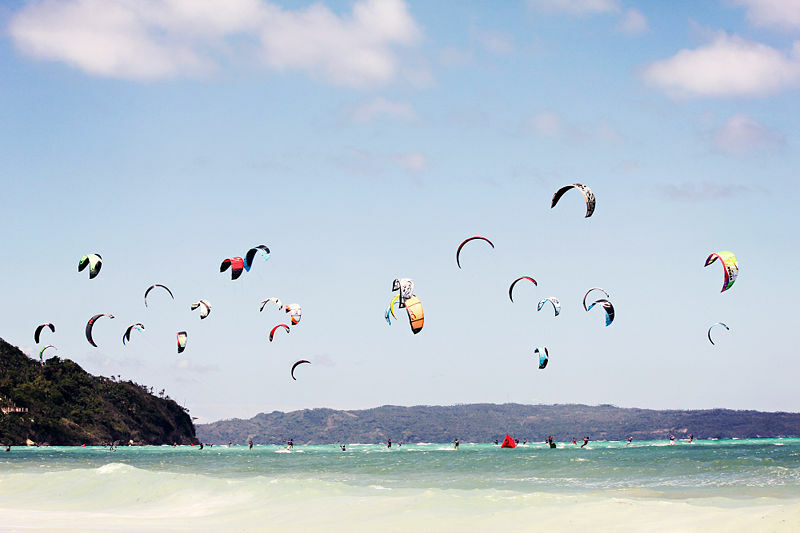 That’s why this is the favorite time of the year for kite surfers to enjoy their sport at Bulabog beach. The sea in Puka Beach is still swim-“able” with some effort. You can hear the strength of the wind on the video. On the other hand, White Beach (located west of Bulabog Beach), is as placid as a deep lake. No waves, just tranquil blue waters all around you. The rainy season is ushered in by the Habagat, the southwest wind, from June to October. This is known as the wet season. This is the season when the winds change. White Beach gets buffeted by the wind and the sea gets rough while the northern and eastern beaches (i.e. Puka Beach, Bulabog Beach, Lapuz-lapuz Beach..) gets it’s share of tranquil seas. So if you are planning a trip to Boracay Island, I hope that these tips can help you decide which dates to take during your trip. If you want to know more about how to get to Boracay read my previous blog by clicking here. 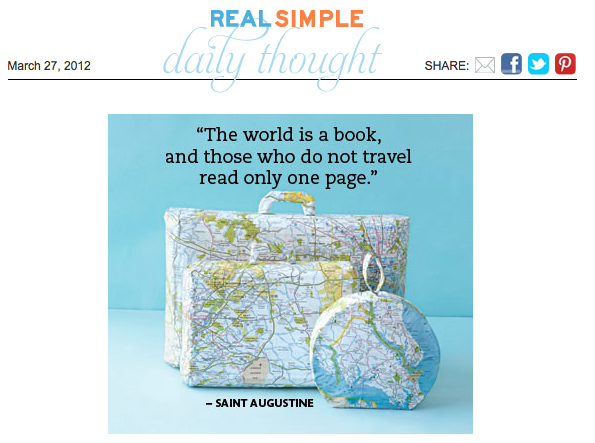 A screen capture taken from my daily subscription from REAL SIMPLE magazine online subscription.